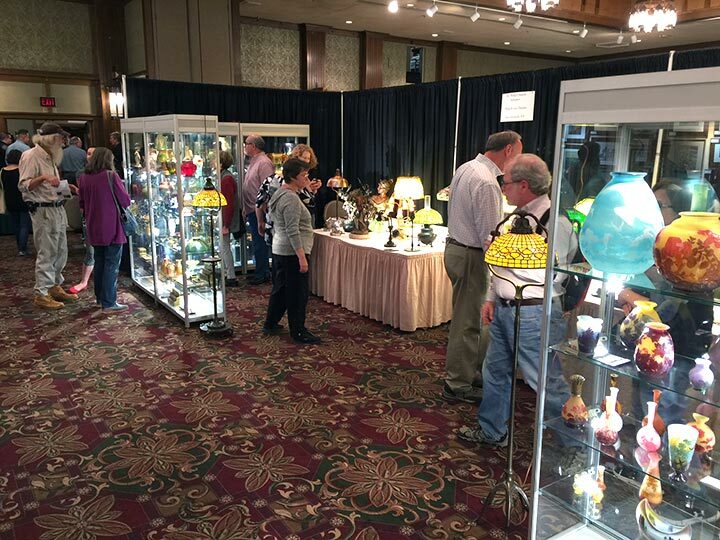 If you’ve never visited the National Arts & Crafts Conference at the Grove Park Inn, you don’t know what you’re missing. There just isn’t another show anywhere like it. Let’s see. The venue is the astonishingly beautiful, historic Grove Park Inn. The show is contained, so it’s its own thing, with a personality. 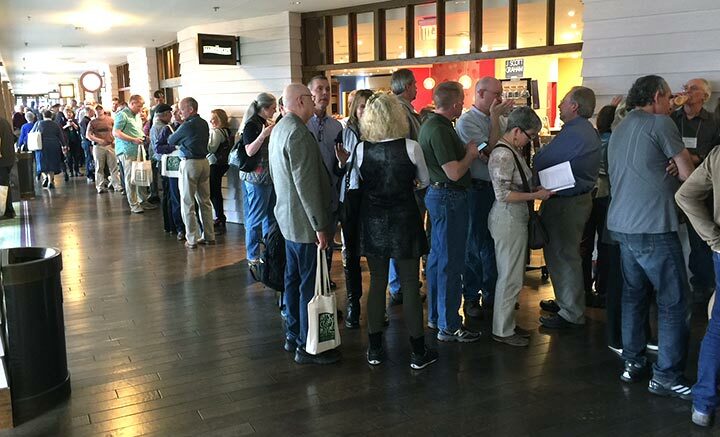 Everyone, including the dealers and attendees, was smiling and in a good mood. 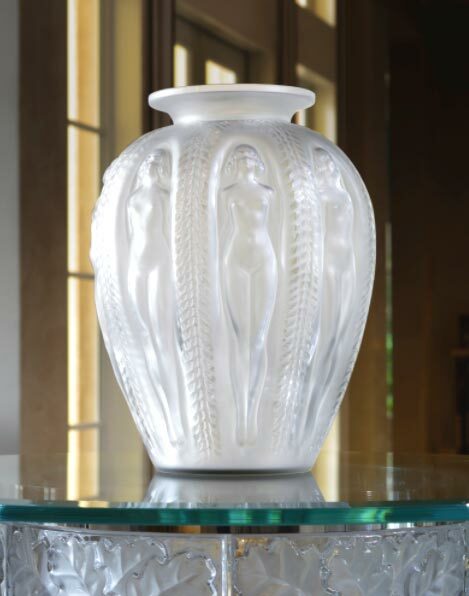 It’s Arts & Crafts heaven, with a ballroom filled with antique dealers and hallways filled with the finest craftsmen of modern Arts & Crafts lighting, ceramics, rugs, bronze, textiles and anything you can think of. The show hours are short and sweet — 5 hours on Friday, 6 hours on Saturday and 5 hours on Sunday, ending at 4 PM. 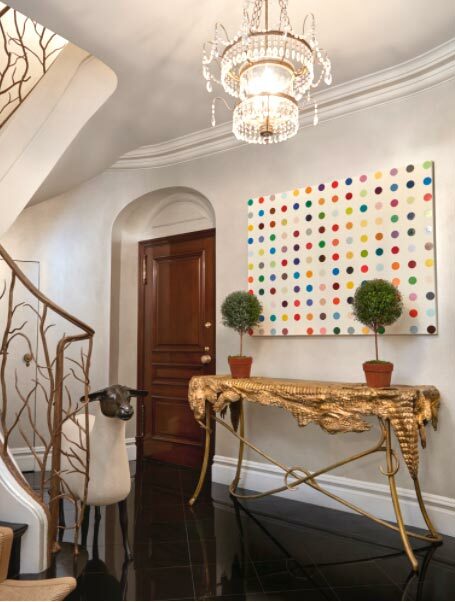 Clients have enough time to make up their minds and dealers leave refreshed instead of exhausted. Nobody doesn’t like this show. It’s our favorite of the year. 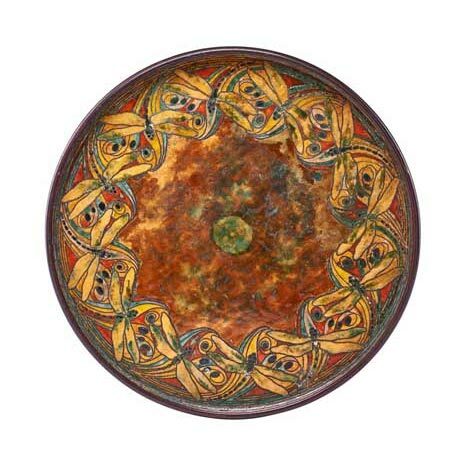 As opposed to the Original Miami Antiques Show last week, this show started with energy and enthusiasm. At 1:00 PM on Friday, the crowd rushed in and the action started right away. We were busy almost all the way to closing at 6 PM. Friday was a good day. Saturday was another story with a much slower pace. What a difference a day makes. 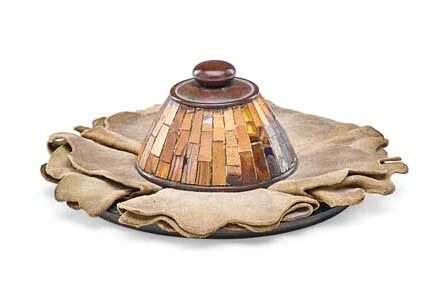 We ended the day disappointed with one small sale. Sunday was slow until a flurry of activity mid-afternoon. 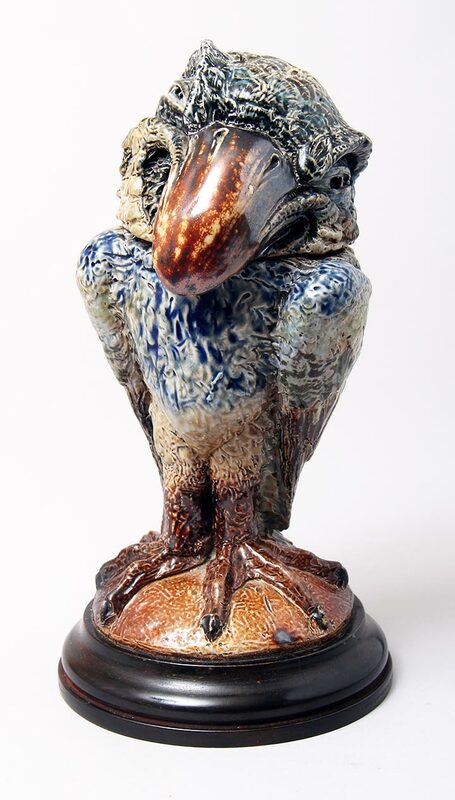 We wound up making three good sales to make it our best-ever Grove Park show! We look forward to next year’s show. Put it on your calendar and make sure you attend next year. I promise you you won’t regret it! By the time you read this post we’ll be on our way home. 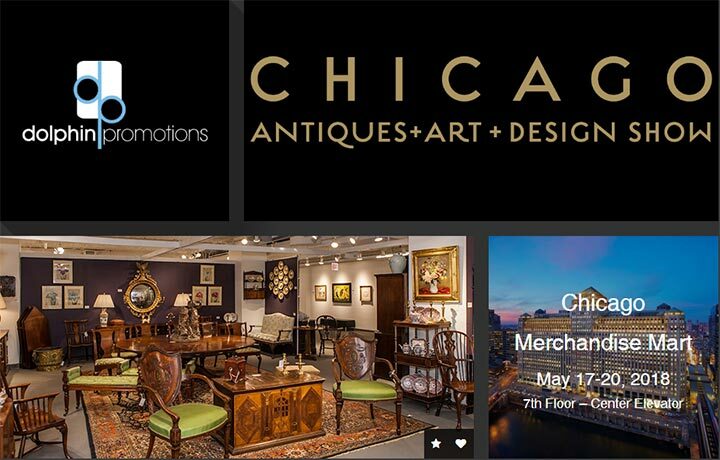 Our next show is not until May 18-20, 2018, when we’ll exhibit at the 2nd edition of the resurrected Chicago Antiques + Art + Design Show at the Chicago Merchandise Mart. It’s a wonderful venue for a show that deserved to be restored from purgatory. Thursday’s post will be delayed until Monday to include the results of the the 31st National Arts & Crafts Conference this weekend. 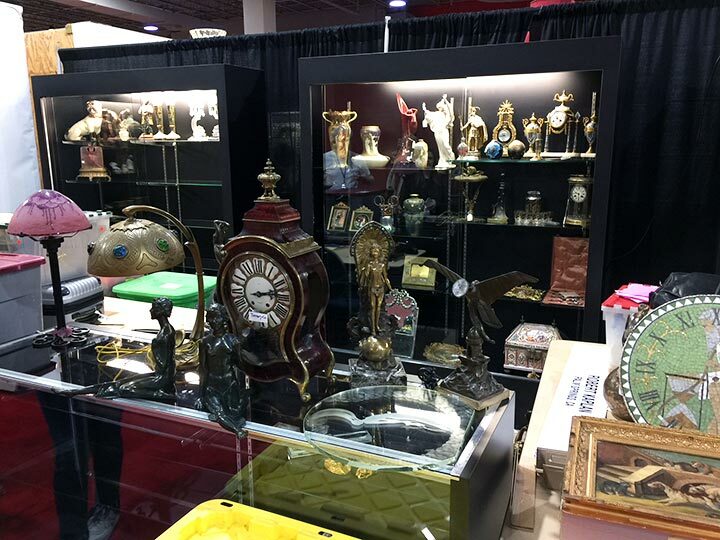 The 2018 Original Miami Antique show at the Miami-Dade County Fair & Exposition Center is now history. 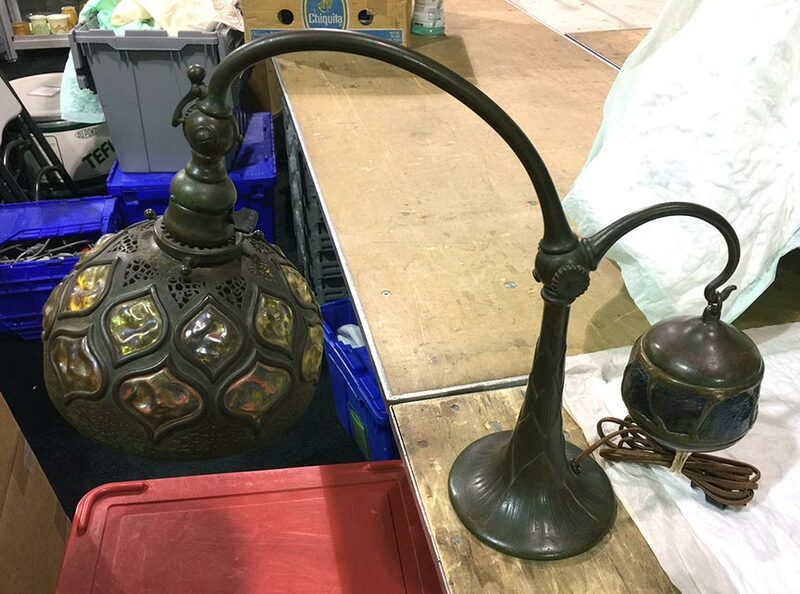 Personally we did okay, certainly not great, selling mostly French cameo glass and Tiffany lamps and desk items. The pace was plodding, with a sale here and there. Most of the action took place each day before 4 PM, with very little after then. 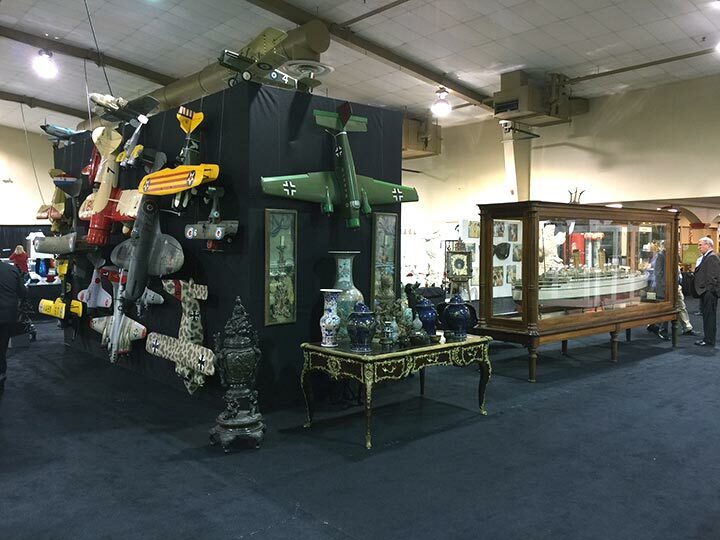 The coolest booth in the entire show, Eduardo Cohen, Buenos Aires, Argentina, displayed model airplanes and ships. Unfortunately I believe he had a poor show. It’s a huge show that’s spread out over several buildings, with one whole building filled with just jewelry dealers. The other buildings were full of a very diverse group of antique dealers. Monday was a total bust. I have no idea why show management insists on ending a show on Monday. Four-day shows should run Thursday – Sunday. It put me in a foul mood, so I didn’t feel like asking other dealers how they did. Sorry. Blame the management. 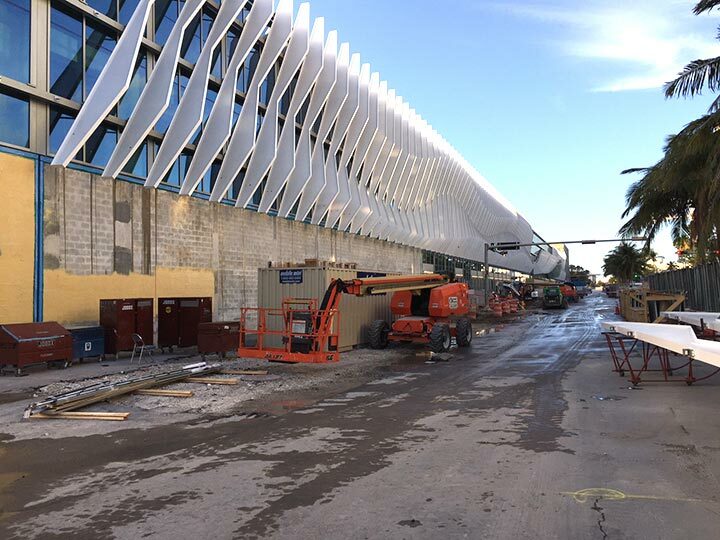 The construction on the Washington Ave. (east) side of the Miami Beach Convention Center is ahead of the west side. We’ve signed a contract for next year’s show at the renovated Miami Beach Convention Center. Got my fingers crossed that the construction proceeds smoothly so we can return to Miami Beach. 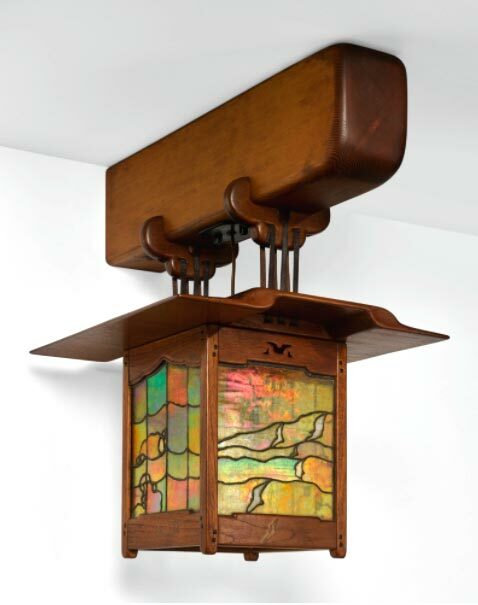 By the time you read this post we’ll be on our way to Asheville, NC, to exhibit at one of our favorite shows of the year, the 31st National Arts & Crafts Conference at the Grove Park Inn, this coming weekend, February 16 – 18. It’s a great show that I recommend you make the effort to attend. 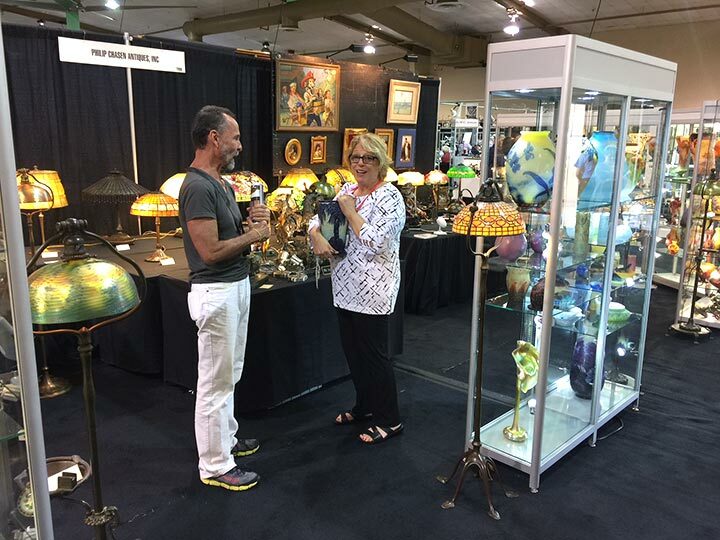 We spent yesterday setting up our booth for the Original Miami Antique show at the Miami-Dade County Fair & Exposition Center. 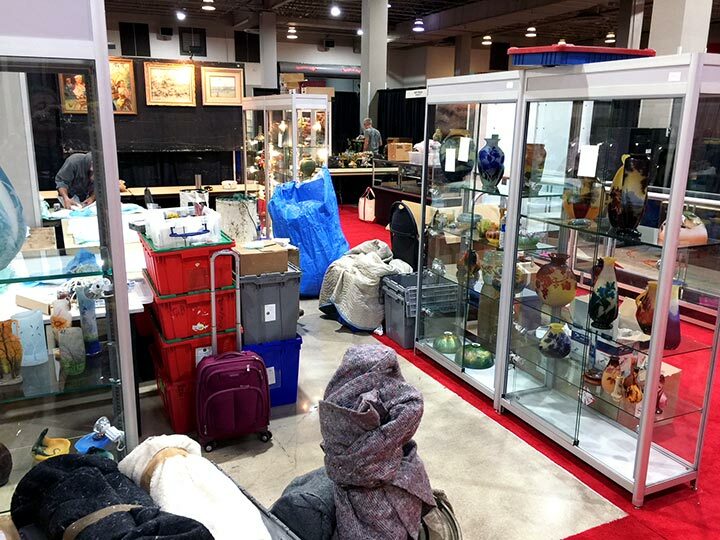 Our booth is a bit smaller than last week, but setup is still going smoothly. We’ll have it all done for Friday’s opening at 11 AM. 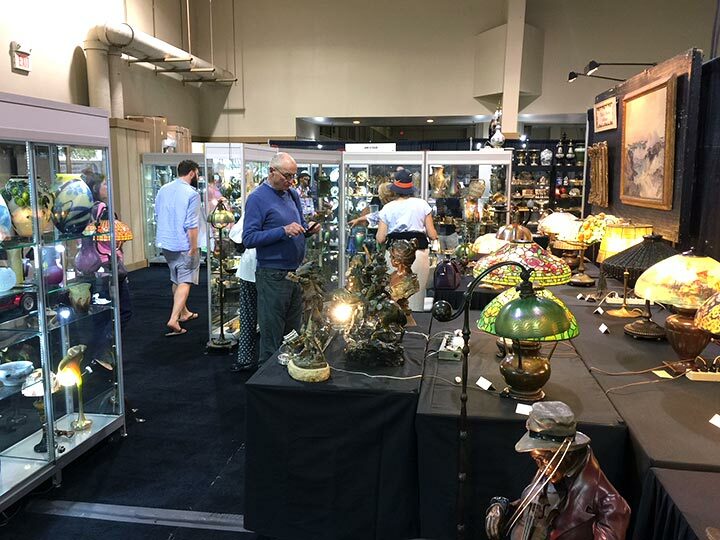 The show is much larger than last week with many additional dealers with incredible and varied selections. Nobody will be disappointed when they visit this immense show. It continues through Monday at 5 PM. Based on the action last week, I’m cautiously optimistic. I will delay my usual post-show Monday post until Tuesday, since the show ends on Monday. 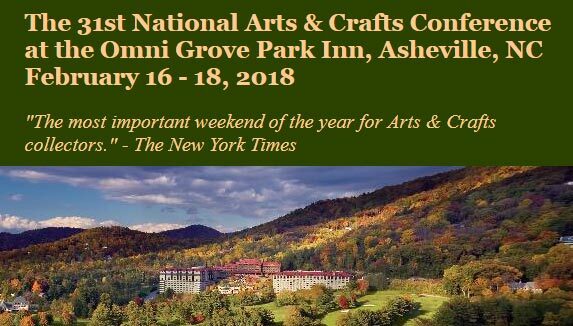 Next week we’ll exhibit at one of our favorite shows of the year, the 31st National Arts & Crafts Conference at the Grove Park Inn in Asheville, NC, February 16 – 18. 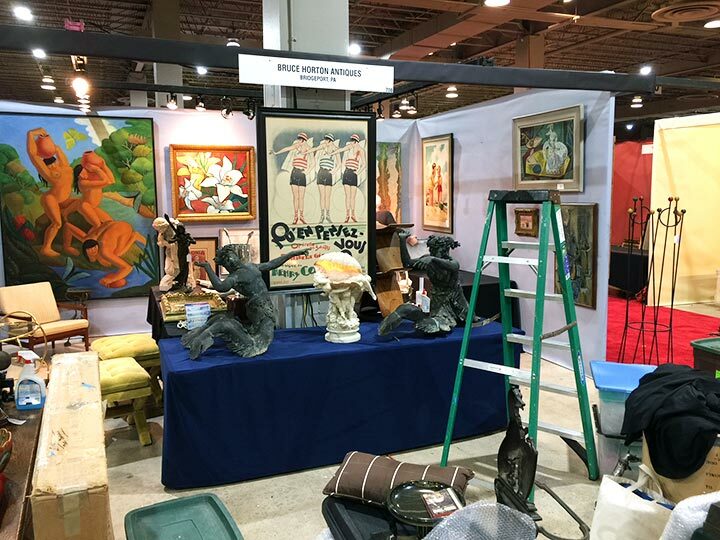 Setup at the Miami Antiques + Art + Design Show is half over. We moved our booth to #513 in aisle 5, so we could have an end cap. 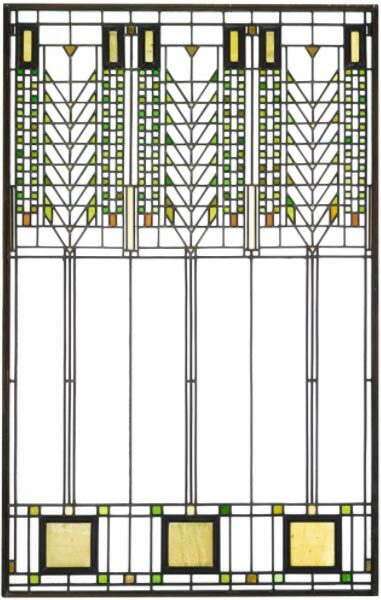 (So called because it’s at the end of a row and crosses between two aisles, 5 and 6.) It’s going well, but it’s a big job with so many items. No worries, though, as it’s a gigantic space, with plenty of room for everything. We’ll have it all done by the time the show opens to the public tomorrow, Friday, at 11 AM. 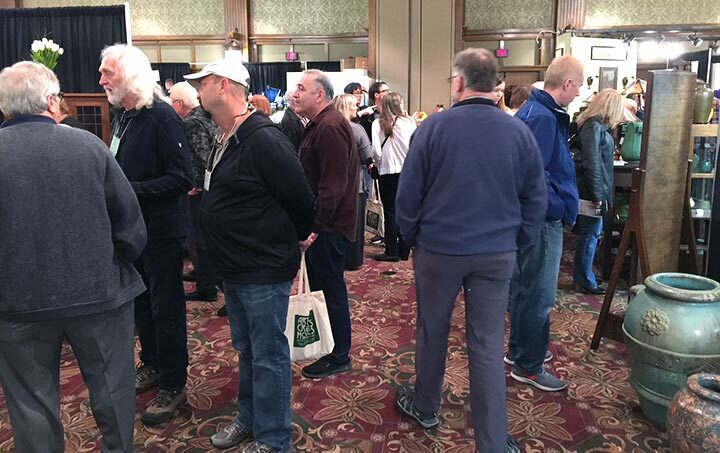 The show is a wee bit smaller than last year, with two fewer aisles. 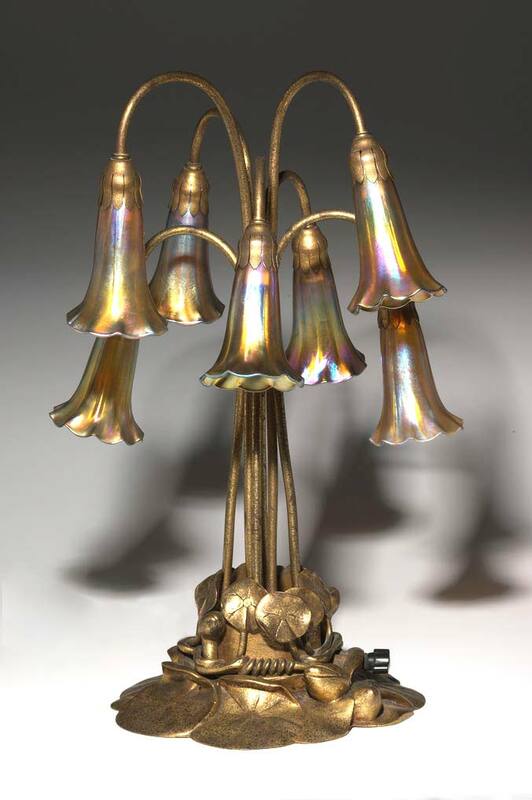 It’s still full of the highest quality antiques you could ask for, in any category from silver to jewelry to paintings to glass and lamps (me!) and everything in between. You will be thrilled with the size and quality of the show. 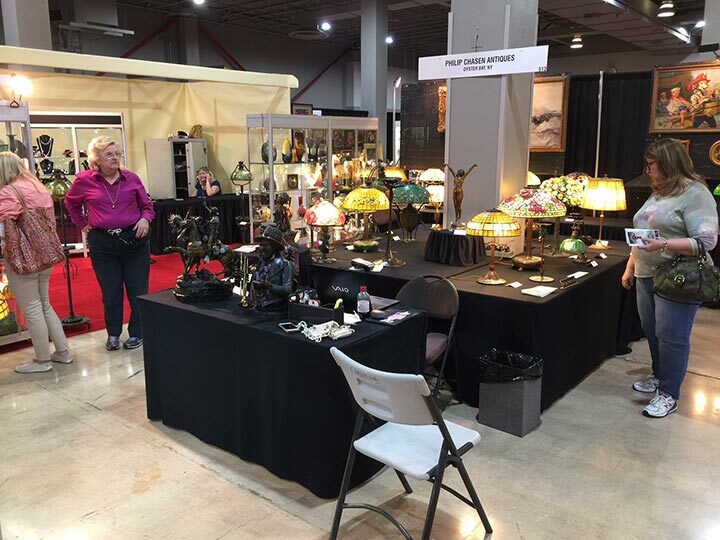 Come visit and help make the show a big success. It’s always good but this year it’s great! 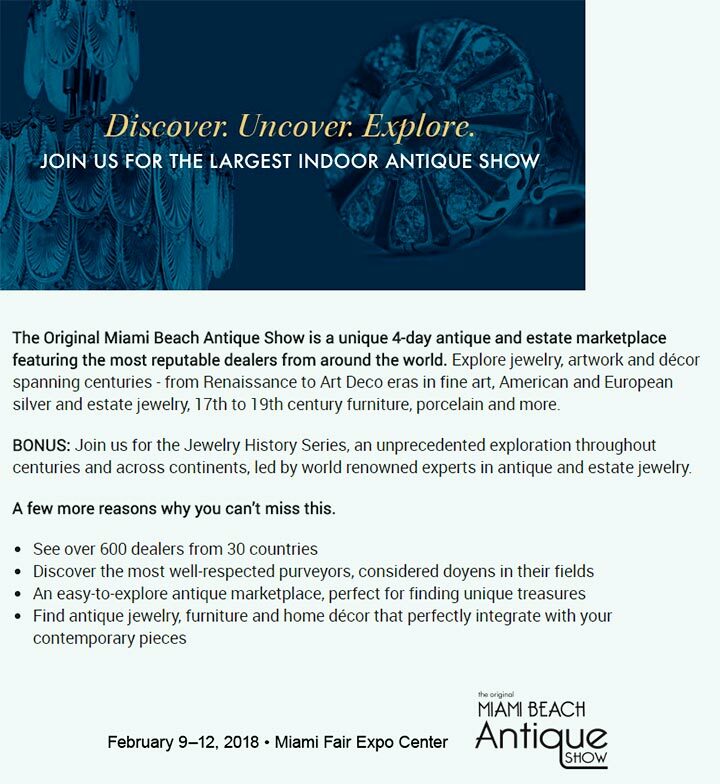 Next week we’ll exhibit at the Original Miami Antique Show at the Miami-Dade County Fair & Exposition Center. Hopefully this is the last time we’ll exhibit there. Got my fingers crossed we’ll be back in Miami Beach next year at the renovated Miami Beach Convention Center.